Today I'd like to welcome author and speaker Susie Larson. 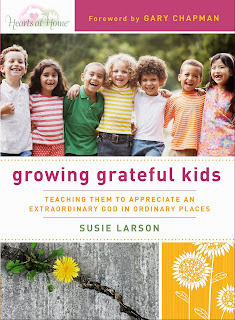 Susie's new book Growing Grateful Kids has just released and I've invited her to share a little bit about this great resource. My husband and I have been married 25 years and have three grown sons (all in their early twenties). Our oldest son Jake works on the business side of the Christian music industry. Our middle son Luke is married to his beautiful wife Kristen; he works full time at a bank and part time as a worship pastor. Our youngest son Jordan is studying to become a surgical nurse. My husband Kevin is a commercial construction manager by day and manages my ministry by night (and weekends). Bless his heart.  I am an author, speaker, and an on-call radio host for Christian talk radio. Together, Kevin and I serve as advocates for justice on behalf of modern day slaves and human trafficking victims. Tell us about your new book, Growing Grateful Kids: Teaching Them to Appreciate an Extraordinary God in Ordinary Places. Even when economic times are tight, our children enjoy an abundance of material possessions. Yet, amidst all this wealth, discontentment and competition seem to be on the rise. Instead of teaching children virtues such as gratefulness and patience, many parents are bending over backwards to get their children the latest and greatest item - or feeling guilty when they can't. In spite of the currents of materialism and entitlement that flow so strong, it is possible to raise children who are simply grateful. Though teaching perspective and gratitude to our children is critical, it is not difficult. To be completely honest, I never wanted to write a book on parenting. I wanted to protect my kids’ privacy and give them time and space to become the men God wants them to be. But in the last few years, I have been especially burdened with the level of selfishness, entitlement and disrespect I see among children today. Furthermore, moms seem more stressed than ever. When I asked my sons their thoughts on writing this book, without pausing they all said, “Do it, mom; that book needs to be written!” I think I wrote a book that not only equips young moms to raise humble, grateful world-changers, but also one that nourishes the soul of the reader and encourages her personally. Throughout the book you remind the reader that we cannot impart what we do not possess. Can you explain? If we never deal with our own fears, insecurities, and hang ups, but we try to teach our children to believe in their divine value, over time, our words will not ring true to them. First God wants to do His work in us before He does it through us. They say that lessons are more often caught than taught. If we parent from a place of conviction and real freedom, our children will be affected by what we teach them. One of your chapters is titled, “Take Time to Play.” How does taking time to play teach our kids to be grateful? To me, taking time to play says a lot about the level of faith we possess. If our children hear us confess that we love and serve a BIG God and yet they see us striving and straining through life, they will come to believe that more is on our shoulders than on God’s. If we can trust God enough to step away from our busy-important lives, to make a fort in the basement, or play a game with our children – even in the most desperate of economic situations – we will give our children a sense of much needed security and that all is well in their world. Hearts at Home is an organization that encourages, educates, and equips women in the profession of motherhood. Hearts at Home encourages moms through annual conferences, our extensive website (www.hearts-at-home.org), a free bi-weekly electronic newsletter, a radio program, and an entire line of books designed to meet the needs of moms all over the world! I am very excited about the message in this book. It is my prayer that every one who reads it will be nourished, encouraged, and equipped to parent from a place of fullness, conviction, and confidence. Raising grateful, confident kids will be one of the most heroic, important things you do in your lifetime. God’s blessings to you!